High profile- concert style- entertainment ready to take your wedding, corporate, our private event to the next level! We are one of the few, if not the only independent band in NY to include a full on concert style visual production with our show. Why? Because at LaToven Productions we believe more is actually MORE when it comes to live entertainment! We don't want to just entertain. We want to blow your guests away with an insane production! Your guests will experience the difference from the moment they arrive - to the second they won't want to leave. A seven piece that sounds like a concert. A mind-blowing and powerful vocal tribute along with a show-stopping performance by the incomparable Charli LaToven- New York's SONY BMG award winning bilingual vocalist, as seen on CBS and Telemundo. Your guests will enjoy some of music's greatest hits spanning over a wide array of genres. Expect everything from Motown, Soul, Funk, Jazz, Disco, Classic Rock, R&B, Dance, Top 40's, and Latin music performed by world class professional musicians. What does the show exactly entail? Lots of eye candy! The show is complemented by our very popular and stunning Glam Theme! We can achieve both a romantic and party ambience based on your needs. These disco balls are an absolute staple in our show because they are always such a huge hit with our clients and their guests. *Two massive 120- inch projecting screens with eye catching visuals that tell a story and bring each song to life in a unique way. Our Sweetheart Package allows future brides and grooms to double our projector screens as enormous portraits! We can create a personalized video with some of the couple's favorite memories and display them for all to see. Always a client favorite as it adds a nice sentimental touch to the evening. *A 10ft tall and 7 ft wide LED Backdrop behind our drummer enhances the visual experience. *Ambience- Helps us set the tone. Specific color schemes may be achieved via our DMX Board. We always ensure our lighting coordinates with specific colors you have chosen for your event's theme so everything looks balanced and beautiful. *Accent lighting- Our Freedom Sticks- another LaToven Show staple- deliver a sophisticated stage presence and energy that frames the stage. These may also be coordinated to match your theme via our DMX light mixing board. *Concert style moving head lights- Our moving head lights are designed to add that extra special concert style effect to our performance as well as keep people on the dance floor all night! *Personalized Gobos with bride and groom names or company logos can also be provided at an additional cost. *Haze- It would be a shame if our clients did not get to fully appreciate our production at it's fullest potential. That is why we use a hazer. They produce a much finer and less noticeable effect than smoke or low fog machines, as they are designed to emphasize the effects of lighting allowing you to see rays and patterns you would not normally see. Pyrotechnic effects- Nothing screams CONCERT more than pyrotechnic effects! We use two Chauvet Geyser P7s for the live show. These are a dynamic pyrotechnic-like effect that creates thrilling bursts of fog lit with seven 9-watt penta-color (RGBA+UV) LEDs for endless color capabilities. Two LED zones can create two-tone bursts of fast dissipating fog without the use of any toxic chemicals, fire or heavy CO2 canisters. *Party favors- Because we love to spoil our audience. *DJ & Emcee- That's right! 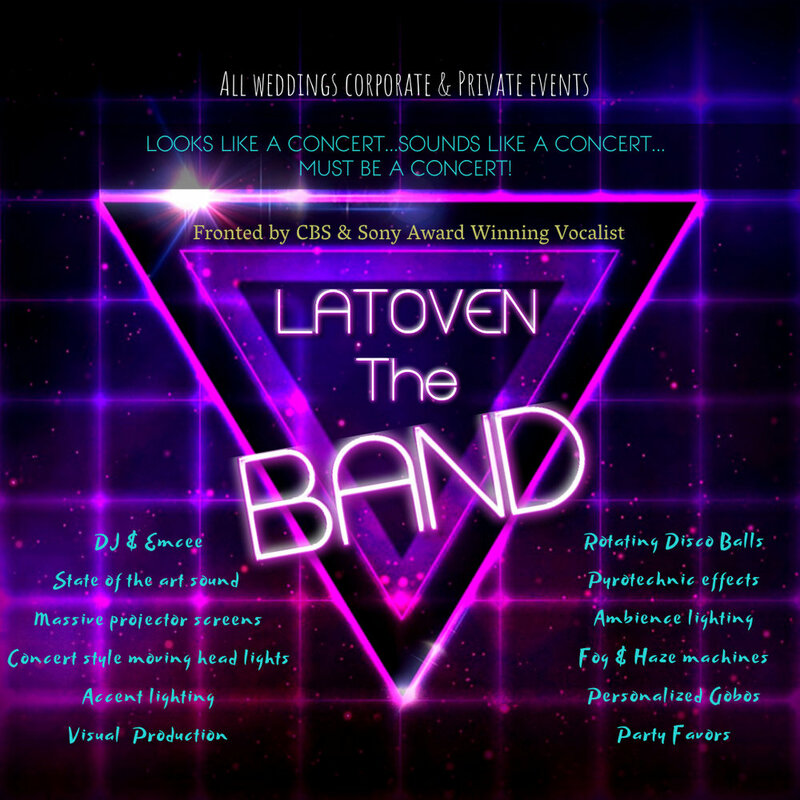 You no longer have to decide between a band or a DJ because for the sake of partying- we decided that you deserve both! In between musical breaks our DJ makes sure that the party keeps going! Our awesome DJ booth lights up with LEDs and sync up in real time to our drummer's LED backdrop for perfect coordination! I'm almost sold but, why should I book this band over others? Next time you need to book high end entertainment for your event, ask yourself these questions. Do you want just a great singer or an outstanding dynamite front lead SONY BMG award winning vocalist? A band that sounds like they are playing at a bar or a concert? *A one on one personal relationship with artists who listen carefully and will share your same vision on the most important day of your life. *No impromptu musical collaborations with musicians who never met or played together before, as many agencies must render due to overbooking and understaffing. Chemistry is everything! *Security- You can still book with the same level of confidence, since we have our very own legal team which draws up all of our contracts. For our past clients it seemed like a no-brainer. For us, it is a personal honor and privilege to partake in the monumental moments of your life. We are grateful for all the friends we have made along the way, and for the friendships we have yet to foster. Looking forward to making your event a memorable one! Welcome to The LaToven family.